A mystical strand of Christianity which emphasised personal, interior spirituality flourished in the late middle ages. Walter Hilton (died 1396) led the house of Augustinian canons at Thurgarton and was one of several influential English mystics. Described as a spiritual travel guide, his 'Ladder of Perfection" ('Scala Perfectionis') instructs in the destruction of vices and directs the soul's upward journey by contemplation of "the perfect love of God". An inscription in the manuscript records that it belonged to the English nuns of St Brigitta (or Brigittines) at Syon, located near Twickenham. Their house at Syon was the only Brigittine monastery in England. 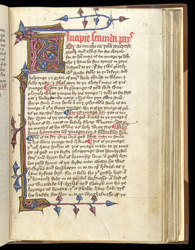 At the top of the page, the inscription in red identifies the beginning of the second part. It opens with a conventionally decorated large first letter which joins up to a border. The book would have been read by nuns as an aid to their personal prayer and daily contemplation.